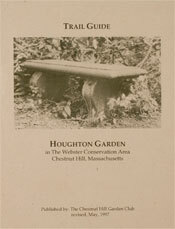 In 1997 the Chestnut Hill Garden Club produced the Houghton Pond booklet to document this historic garden. From 1906 through 1940 Mr. and Mrs. Clement Houghton created a garden adjacent to their home at 152 Suffolk Road in Chestnut Hill. Mrs. Houghton served as the president of the American Rock Garden Society and her love of rock gardens resulted in one of the first of its kind. Their alpine rock garden is situated on a ledge overlooking Houghton Pond. It contains many dwarf conifers originally imported from the Orient by the Houghtons. In 1999 the garden was listed in the National Register of Historic Places. Over the years present and former members of the club have donated new plant material throughout the garden, and today members join in its maintaince. The garden is open to the public.